Wow-za! It’s been so busy around here! I woke up remembering that I forgot to draw the winners for this great book. So, as the early morning trash trucks are rumbling down the street I’m up in the dark selecting the random winners. contact me: lacyjhansen at gmail dot com and I’ll get your book to you ASAP, promise! In the meantime, here’s a really short video as we actually got to the finish line. You can hear my breathing and see just how slow we’re moving. You can also see that I’m just walking in my Dad’s footsteps. It’s a precious memory for me. I’ll also let you read our second attempt up the Peak. It was only one year later and it was ugly! 2008′s Ascent ended up being called off during the race due to a monstrous blizzard above tree line. We received that news about 10 miles up the trail. The only way off that trail was to turn around and go back down. 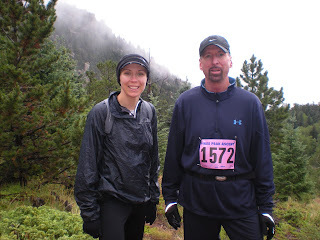 Our 1/2 Marathon ended up being a 20 mile mountain hike in the freezing rain. Still a priceless memory, just not as found. 2008 Pike Peak Ascent- or Descent as it were! I remember that 08 race because my kids' principal and one of the teachers were there, and came back telling tales of the epic blizzard. Certainly does make it memorable, though.